It comes back to me..."
Above is a quote from Karma that embodies the spirit of the newest Rick Springfield release. Available April 13 in record stores and on the Internet, Karma marks the latest recording effort this legendary talent. 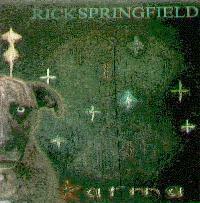 Combining an adult contemporary feel and Rick's rock roots, it is a must have for any music lover. The first single, "Itsalwayssomething," will be available roughly two weeks prior to the album release...look for it and request it on radio. How wonderful it is to see Rick getting what he deserves to come back to him...the love and respect of not only his fans, but his peers in the business. If it's good Karma you want, it's good Karma you'll get...this is THE time to be a Rick Springfield fan. This is a spoken piece about Rick's dad's death by Rick, his brother Michael and Rick's sons.
" I've been good at snatching defeat from the jaws of victory..anytime I stopped to smell the roses they drew blood from me.."
"You raise your glass, you drink their wine, but you're still thirsty all the time..."
"She can't remember how it was before, she doesn't know who she is anymore, she's in disguise as his beautiful prize..."
"It's there in the air that I breathe, it's in my whisper and scream, inside everything I believe and it's all gonna come around someday..."
"For the first time in my life I'm awake and alive..."
"When we are one, I am complete, and I'm undone, and I will be free in your eyes..."
"Now I send a prayer to heaven, for the chance to be, a better man than the man I see..."
"Look at something long enough you'll find that the splinters and cracks begin to show..."
"The door slammed, it left a scar, she'd be damned she could see her in his car, so much for marriage and the good, good wife...well maybe it's a fact of life..."
"Something about her opens up my soul, something about her speaks the truth..."
"It's gonna take an act of faith to stand up and face the day..."
*Note the additions to the American release. Karma is in stores now! It's Always Something has been released as the first single to radio, so call those radio stations! The record will be distributed through a company called Platinum Records. The distribution is therefore a collaboration between Platinum and Rick's own label, Super Ron Records. Keep asking and checking on this long awaited release: the record stores are already preordering in large amounts due to the many inquiries about "Karma". Fortunately for fans, Rick has been playing the new music live: It's Always Something, and most recently, Karma, have been performed live. The avid listener has been hearing Prayer over the loud speakers at some of the shows. The hype around Karma is international. Thoughtscape Sounds is offering "Karma" NOW through a Japanese import. Currently on it's third pressing in Japan, the Japanese version of Karma is a hot ticket. If you are looking for another piece of interesting memorabilia to add to your collection, you can order the Japanese Version of Karma by calling 1-800-435-6185. Many fans obtained their copies of Sahara Snow (see below) through Thoughtscape and were pleased. You can peek at their website by going to www.thoughtscape.com . There are several other outlets offering "Karma" if you find Thoughtscape sold out: try www.aorheaven, www.amazon.com, or even www.ebay.com. from his forthcoming "KARMA" album, popped into his brain. "I dreamt that," said the 49-year-old Australian born singer. "I woke up with the chorus and the words to the chorus. I jumped up out of bed and sang it into a tape recorder. That's usually enough to prompt me toremember what I was thinking. Of course, sometimes it turns out to be a Rolling Stones song. But a lot of times it's original." about the fly in the pudding." The loss of his father right before Springfield finally cracked the U.S.
"Rick Springfield: Behind The Music," on VH1. The special covers Springfield's entire career, from his teen years in Australian rock bands, his early success in the United States(his "Speak To The Sky" single hit No. 14 in 1972) and, finally, his triumphs in the 80's, when he scored five multi-platinum albums("WCD", SHSMY, LIO, HTH, ROL) and a string of hit singles( DTTD, AOTH, HT, LS, CL). The documentary also touches on his lifelong struggle with depression, a career-threatening ATV accident in 1989 and the making of "KArma," his first new album in a decade. for about six or seven hours, so it should be pretty in-depth." Spelling's "Robin's Hoods," the syndicated "High Tide" and numerous TV movies, including the sci-fi thriller"Legion" with parker Stevenson. not instant. He's been working on it for the last three years. "It's maybe-maybe- more acoustic driven than previous albums, because I wrotea lot of it on acoustic guitar," he said. guitarist in Springfield's first band. When he went to mix the track, he did something he's never done before. "Usually after I demo it, I speed it up even more when I record it," he said. feel to it." What he likes even more is the sentiment. that is the real way. Or, maybe, that's not true either. But I suspect it is."